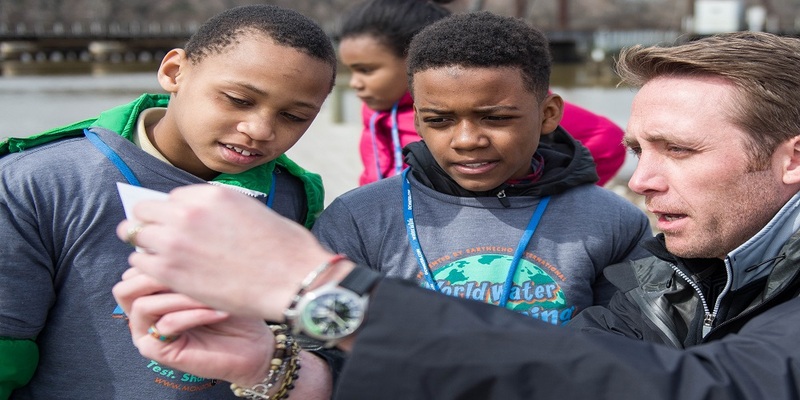 WASHINGTON, March 6, 2019 /PRNewswire/ -- On March 22, the United Nations World Water Day, Philippe Cousteau, Jr.'s EarthEcho International and Xylem Watermark invite people everywhere to be part of a global movement to protect critical water resources by participating in the EarthEcho Water Challenge. Individuals, schools, businesses and community organizations can make their communities healthier and more sustainable through the simple actions of testing water quality locally, sharing data internationally and taking action to protect local waterways. Dive into the 2019 EarthEcho Water Challenge with worldwide community events hosted by Xylem volunteers and EarthEcho Water Challenge partners, a new class of Water Challenge Ambassadors, a live virtual field trip for classrooms nationwide and a special launch event in Houston, TX, led by Philippe Cousteau. "The EarthEcho Water Challenge is designed to help anyone, anywhere take action to make their community stronger and safer by protecting a natural resource we depend on every day. Understanding where our water comes from and how each of us can play a role in protecting it is a great first step in learning how our natural resources connect individuals and communities around the globe," said EarthEcho founder Philippe Cousteau. "By participating in the EarthEcho Water Challenge anyone can make a positive impact starting today." EarthEcho kicks off this year's Challenge with an invitation to classrooms to join a live, virtual field trip – Water Journeys. This special event, on Tuesday, March 19, at 1 PM EST, will connect students live with EarthEcho Water Challenge partners working around the world to engage communities in monitoring local water quality and taking action to protect water resources. Participants can register for this free event at: http://bit.ly/WaterJourneys. Test – It all begins by understanding the health of the waterways in your community. Get started by purchasing a simple water quality test kit at www.monitorwater.org. Share – Participants share their water quality data online through the EarthEcho Water Challenge database and post their stories and photos at www.monitorwater.org or though social media using #MonitorWater. Protect – Armed with knowledge about local water resources, anyone can use the information and tools available at www.monitorwater.org to protect their local waterways every day. One of the many EarthEcho Water Challenge activities taking place during World Water Day is the special kick-off event in Houston, TX, hosted in collaboration with YES Prep Public Schools, the Galveston Bay Foundation, and Xylem volunteers. The event will engage over 2,000 YES Prep Public School students in water quality monitoring, including a field experience in Kemah, TX allowing students to learn about water quality and conservation on Galveston Bay. Portions of the event will live-stream on EarthEcho's Facebook page. EarthEcho Water Challenge sponsor Xylem Watermark will host employee-led events to conduct water monitoring activities with students in schools and local youth organizations worldwide as part of their Make Your Mark 30 Day Service Challenge kicking off on World Water Day. EarthEcho Water Challenge Ambassadors World Water Day 2019 also marks the continuation of the EarthEcho Water Challenge Ambassadors initiative with the announcement of a new class of young environmental leaders from across the United States. Coordinated by EarthEcho International's Youth Leadership Council (YLC) and sponsored by Xylem Watermark, the Water Challenge Ambassadors will increase knowledge of local water resources throughout their communities by leading citizens through water quality monitoring events and water restoration and conservation programs. To learn more about the Water Challenge Ambassadors, visit http://monitorwater.org/ambassadors. Get inspired for this year's Challenge with the EarthEcho Water Challenge Action Portal which highlights ways to take positive action around waterway protection and provides instructions for young people and community members to replicate these types of projects in their own communities. Explore the Portal at www.monitorwater.org/protect. The EarthEcho Water Challenge is made possible through the generous support of Xylem Watermark. A diverse group of global partner organizations collaborates with the EarthEcho Water Challenge on outreach, resources, and events. Learn more about these organizations at: www.monitorwater.org/partners.